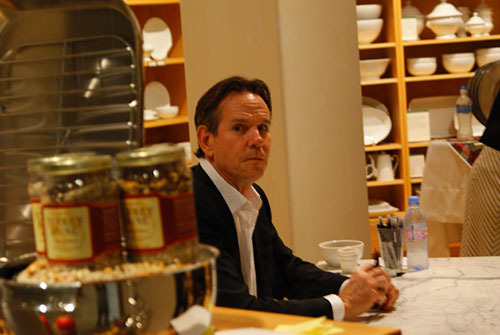 Of course, by now everyone is pretty much aware that Thomas Keller's long-awaited Bouchon bistro is opening in Beverly Hills next week. From what I hear, the restaurant is already booked solid for the first several days of service, so there's hasn't exactly been a dearth of excitement and anticipation surrounding the place. 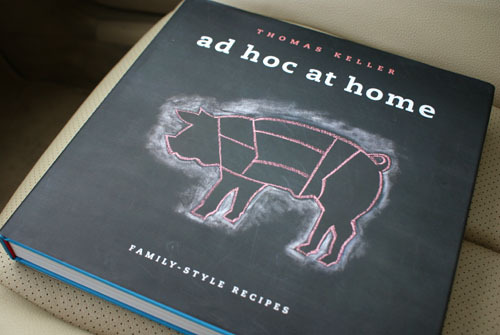 Adding fuel to the fire is Keller's new cookbook, Ad Hoc at Home, which was officially released just last Friday. This new tome takes a simpler, more comfort food-based approach, inspired by the menu of Keller's casual eatery Ad Hoc in Yountville. 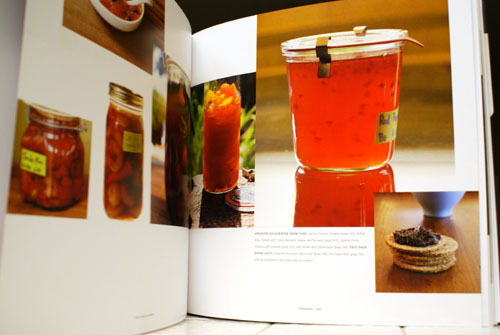 It should be more accessible to the average home cook vis-à-vis Keller's other books: The French Laundry Cookbook, Bouchon, and Under Pressure. Spanning 368 pages, the book details over 200 recipes for family-style dining (including such classics as beef stroganoff, Santa Maria tri-tip, and yes, the heavenly buttermilk fried chicken), and also provides step-by-step lessons in basic kitchen technique (e.g. how to truss a chicken--Keller's unfamiliarity with the technique famously made him a target of a knife throwing incident at Café du Parc). 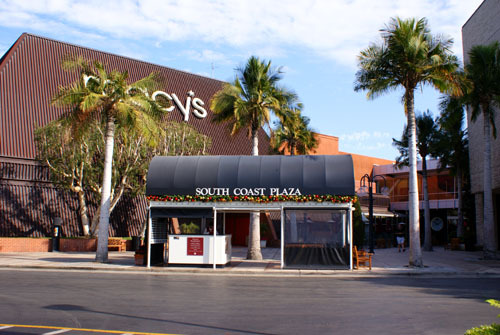 South Coast Plaza is, of course, the nexus of high-end shopping here in Orange County. 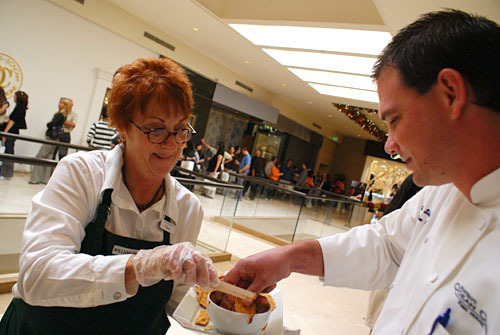 It's the third largest mall in the country, and home to notable eateries Marché Moderne, Charlie Palmer, and the soon-to-be Capital Grille, which replaces the ill-fated Clubhouse. Leatherby's, Mastro's, and Pizzeria Ortica are just across the street as well. I wasn't even sure if I could make it, but I ended up arriving about ten minutes after the mall opened, and was able to score parking in the valet area. 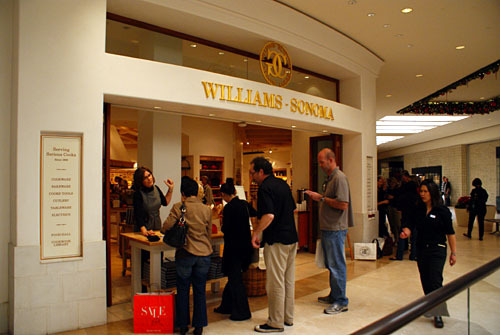 From the parking lot, it was a quick jaunt to Williams-Sonoma, which was already bustling with activity at this hour. I was told that I had to go inside to purchase the book, at its full $50 retail price no less (it was under $30 at Amazon). 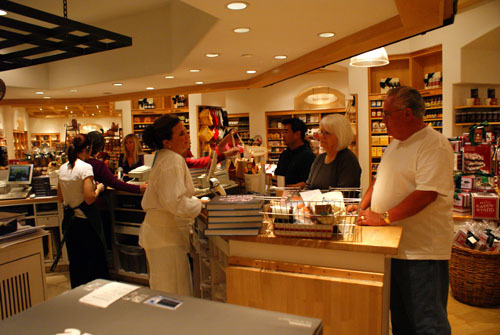 Pretty much everyone was here for the signing, and piles of the cookbook were stacked haphazardly throughout the store. After buying the volume, I made my way outside, only to be confronted by a rather long line of motley characters, which started at the Williams-Sonoma entrance, ran along the store, past the mall's secret VIP club, took a U-turn at Sak's Fifth Avenue, circled back and ended at the Macy's Men Store. The queue would eventually span past Lawry's Carvery, going all the way to Tourneau. 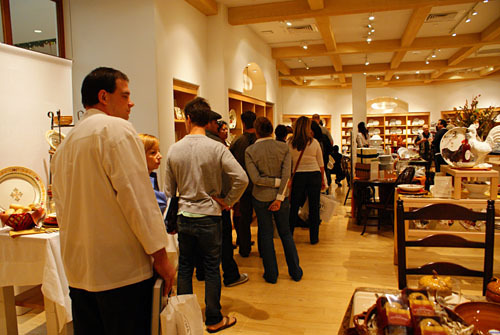 I'm told that the line for Giada De Laurentiis' book signing here was even longer. 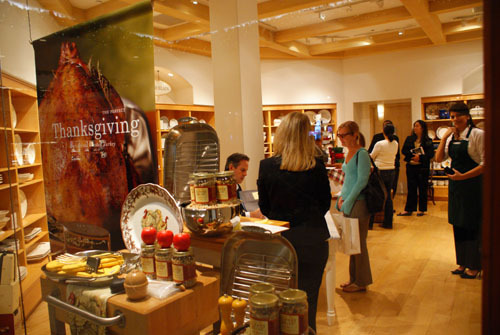 Williams-Sonoma's staff made sporadic rounds armed with food from the cookbook. First was a sugary Fig and Balsamic Jam, served with flatbread. Next was the Cream of Cauliflower Soup, which seemed to lack the red beet chips called for in the actual recipe. Nevertheless, it was a rich, creamy, hearty potage that nicely captured the essence of cauliflower; croutons, meanwhile, mixed things up texturally. While in line, I spied a few familiar faces. First was Holly of The Michelin Project, who we see striking a serious yet sultry pose (the guy beside her seems to be taking notice as well). In the second photo are Bruce (a reader whom I went to Urasawa with), two unidentified women, Christine of Folie à Choisauce, and Ryan of Only Eat What Feeds Your Soul. 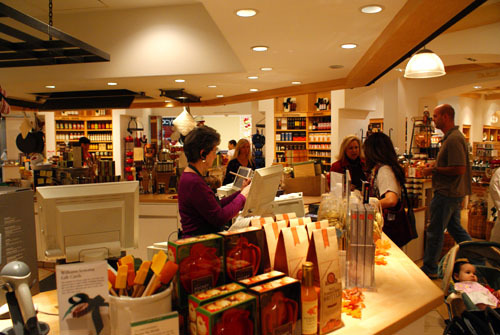 ...And in no time, we were inside Williams-Sonoma's inner sanctum. Idalia's turn with the chef--she brought two copies of Ad Hoc at Home, as well as a copy of French Laundry's menu from earlier this year. And finally moi. 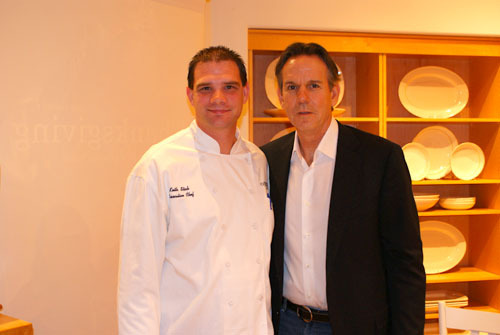 We only had a minute or so with Chef Keller--no time to be verbose--but I did manage to speak with him about his father, Ed Keller. 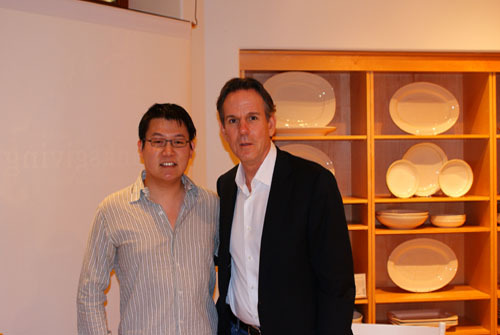 Ed, of course, was instrumental in helping me get my first reservation to French Laundry back in March 2007. I ended up returning to dine at TFL in May, and my dining companions and I had brought Ed some cigars as a token of our gratitude (Ed loved cigars), a beautiful box of 20 Macanudo Vintage 1997s. Unfortunately, Ed got into a serious auto accident the month prior, and was never able to enjoy the smokes prior to his passing in April 2008. Holly and here new friend Bree, about to enter. One last look before leaving. And here's the cookbook, my first ever no less. Note Keller's fluid, graceful penmanship. It reads: "It's all about family." Indeed. 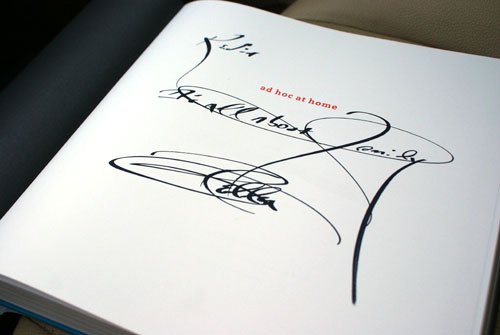 My favorite cookbook of the year, no doubt. I choked up a bit reading about TK and his dad in the NY Times and immediately remembered your post about him. 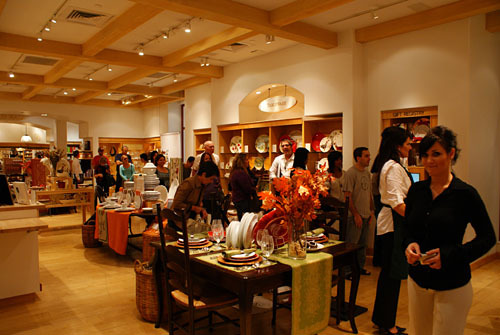 I'm definitely going to hit up Ad Hoc when I'm in the Bay next month, along with Ubuntu and Commis. I have to simultaneously thank you and curse you for your incredible website. The insightful reviews and excellent photos are truly a pleasure, however, I've wasted hours at work checking them all out! I've forwarded your link to several of my friends and they all rave about it as well. Thanks for doing this. Cheers! Your post about our 2 hours in line is great!! Great job with the pictures. You are very talented with the camera as well! I thought about going to this, but paying $20 extra to have Thomas sign a cookbook I'm going to get dirty seems odd ;p. That being said, I'm going to go wait in line today for 2+ hours for a Bill Simmons book signing. heh! 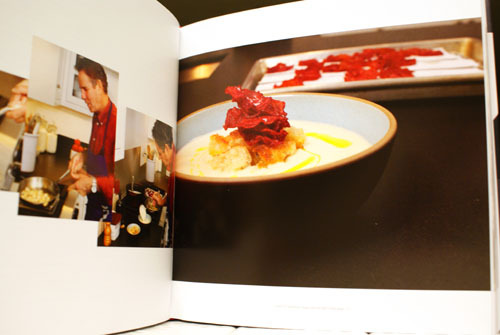 Have fun cooking from the cook book! Great seeing you! Next stop: Bouchon. Awesome write up as always. If I was in town, I would have gone and said Hi to yah. I ended up dining at L'etoile and Alinea again. Maybe next time! I waited 3+ hours in line to see Paula Deen and Giada Di Laurentiis (separate occasions). I was thinking maybe Paula's line took so long because she did spend time talking to everybody for a while, and stayed until the last person, but Giada's line was just as long, and she barely spoke. I guess there was just a lot of people wanting to see that famous cleavage in person. Kevin, how do you know all these people, their career histories, and restaurant background info? You're always so well informed in your posts. Jai: That was a great article. It really made me think about my experience with Ed as well. Enjoy your time up north. I'm especially curious about Commis, because I haven't heard much about it. The chef's resume looks impressive I gotta say. unlearned hand: Thanks, hopefully there's more thanking than cursing! Idalia: Thank you Idalia, it was great meeting you! Jo: So Ad Hoc at Home is about FAMILY. Bouchon is about SHARING. What's Under Pressure about then??? Shirley: When are you going to start blogging again? I thought it was supposed to be on the 1-year anniversary of Urasawa. 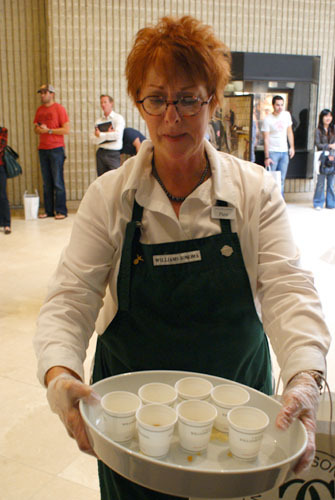 Holly: I'll be at Bouchon opening night. You too? Joce: L'Etoile and Alinea aren't bad places to end up! I'll look out for your posts. Yena: Ok, now I don't feel so nerdy for waiting two hours here. As far as knowing all this info, I usually do some research before writing my posts. 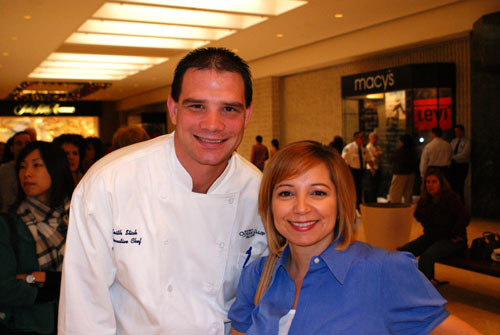 Often times, the restaurant's web site will have a complete biography of the chef. Anon: Wait, so you were the girl in the purple shirt??? How early did you have to show up? 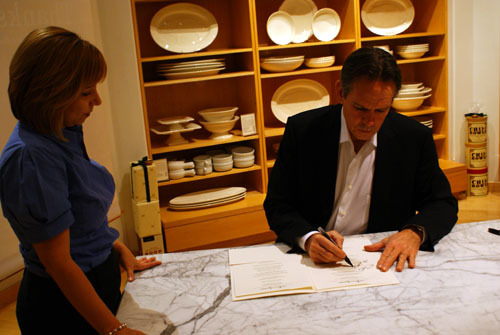 I heard that he was signing anything; I saw a lady walk out with signed oven mitts. I love the fact that its an open kitchen and you can get a counter seat and watch the chefs in action and talk with them. another great post! were u able to stay for the discussion? Yes - that was me - in the purple shirt!! I was told by the folks at WS that he would sign anything!!! TK seemed surprised that I asked him to sign the pig cutting board but he was glad to sign it. 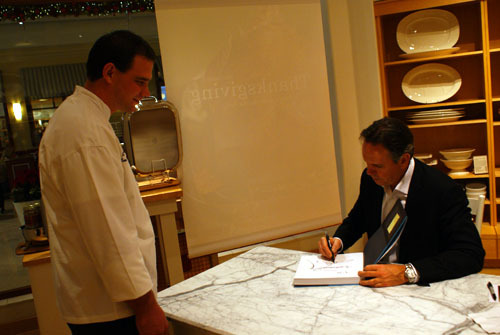 BTW - cross your finger for me - looking to make it into The "impossible to get a reservation" French Laundry next year! Oh I was there at 8am! Jai: The NYT link isn't working, but I did enjoy the SFMag article. I think I'll have to add this place to my culinary itinerary next time I'm up there. Daniel: Thanks. I didn't stay for the discussion, as I didn't even know there was one. I heard that Borders had signings in Torrance and Century City, which no one showed up to. I guess they did a poor job promoting them. 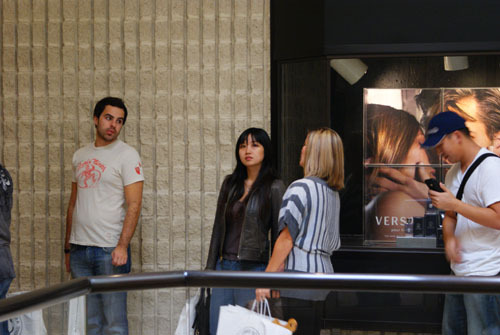 Anon: I thought the mall opened at 10:00, so could you even get inside? In any case, I hope you get into TFL! Purple shirt girl here.... actually, I took a chance to see if the mall was open (sometimes they are and sometimes they aren't)....And thanks for the good wishes on TFL! 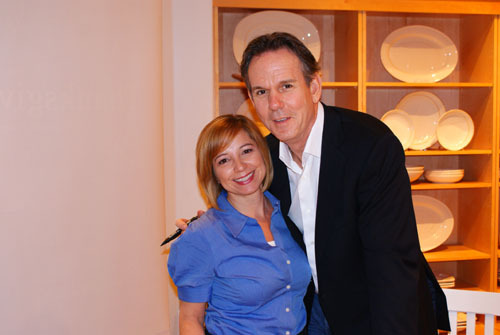 BTW - did you happen to catch TK on the Martha Stewart Show today? 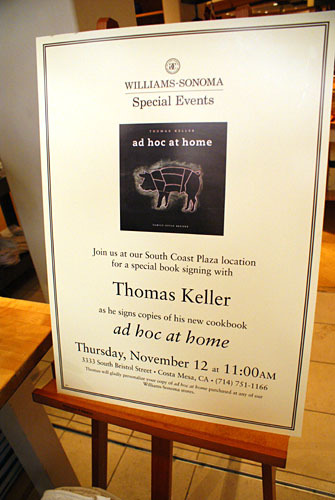 He gave away ad hoc at home cookbooks along with a pig shaped cutting board!!! I'd like to think that it was me who inspired that pig shaped cutting board... when I asked him to sign it, he seemed rather tickled by it..... and now it shows up as gifts at this appearances on TV! I know this post is a couple weeks past the post date, but that is my sister in the first panoramic view of the line, third from the right standing up in the black coat. Wish I could have been there! Anon: I didn't catch TKel on the show, but I did hear about it, which made me think of your story!